Bishop Dena Harrison commissioned these wall crosses for gifting. The center form is made from metallic gold polymer clay pressed into a rubber mold made from her pectoral cross. 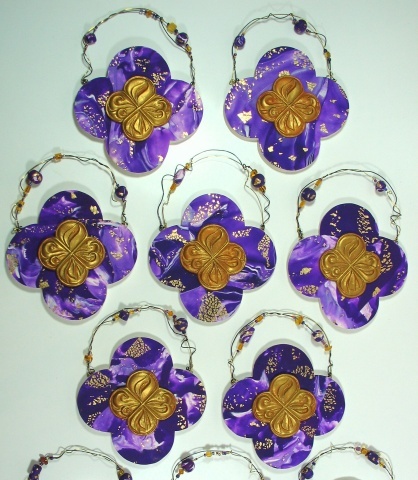 They are exact size replicas of her pectoral cross and then mounted on larger purple gold leafed clay backgrounds and embellished with beaded wire hangers. Each one being a little different with background and hanger variations.